Mumbai: One of the criticisms the Reserve Bank of India has faced lately is that it’s being too stringent in applying the prompt corrective action (PCA) framework for banks. This has hurt the flow of credit to the economy, critics say. But a Mint analysis shows that far from being too stringent, the central bank has shown forbearance with some of the banks that are not already under PCA. At least four more banks need to be censured for not meeting the central bank’s specified risk thresholds, if RBI follows a strict rule-based approach. 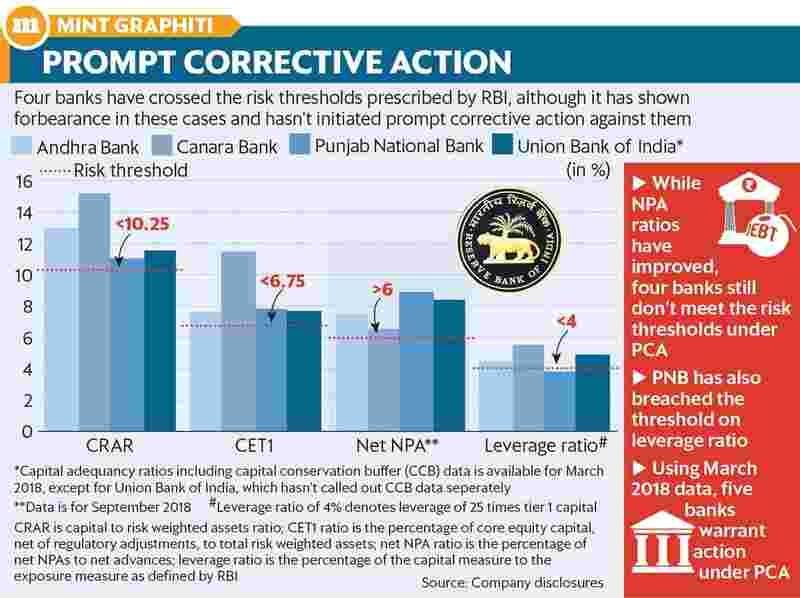 These are Andhra Bank, Canara Bank, Punjab National Bank (PNB) and Union Bank of India, each of which has breached the maximum permissible levels of 6% for net non-performing advances as a percentage of total advances. PNB has also breached the risk threshold for leverage ratio, with the exposure rising to over 25 times its tier 1 capital. RBI rules state that PCA can be imposed if any one of the risk thresholds for capital, asset quality, profitability or leverage is breached. Thanks to the government’s recapitalization earlier this year, these banks met the minimum capital requirements needed to avoid PCA. But most government-owned banks that are outside the PCA framework may soon trip on the requirement that their return on assets shouldn’t be negative for two straight years. Almost all of them reported losses in FY18 and it seems the situation won’t be different this year, based on the first half results of FY19. Of course, the trigger for this risk threshold is yet to happen, if at all. But as far as the threshold on asset quality goes, RBI is clearly being patient. Net non-performing asset (NPA) ratios were far worse a few quarters ago. In fact, using the measures as of March 2018, another bank—Punjab and Sind Bank—had crossed the risk threshold prescribed by the central bank. Critics argue that the net NPA ratio should not be seen in isolation, especially if banks have sufficient capital. But by the same yardstick, looking at only capital adequacy ratios is myopic. After all, while recognition of NPAs has improved in the Indian banking system, provisioning norms are still conservative. As such, reported capital can be overstated, since it doesn’t account for losses that have occurred with some client accounts. In jurisdictions where only capital ratios are considered in the PCA framework, NPA provisioning norms are more stringent. Perhaps RBI’s forbearance has to do with an expectation that the government will recapitalize these banks, so that provisioning for their NPAs do not drag their capital down to alarming levels. PCA has been imposed on 11 state-run banks, which did not meet RBI’s specified thresholds on either capital adequacy, asset quality or profitability. The idea behind the strictures on these banks is that they preserve capital and regain their health, which means that lending takes a hit. A related charge is that the RBI hasn’t been open to reason about the need for greater liquidity, and there are calls for a greater say for the RBI board. Again, this ignores the fact that several members of the RBI board have clear conflicts of interest. Business professionals and owners, clearly, can’t have a large say in matters such as bank ownership. Similarly, government nominees may bat for more leniency on PCA norms, but that would involve a conflict of interest, given that the government owns a majority of the banks in the country. It’s for a good reason that RBI has relied on sector experts in framing rules and looked to the board for broad directions. If the government is unhappy with the form of functioning, it should perhaps revisit the accountability mechanisms it has for RBI.